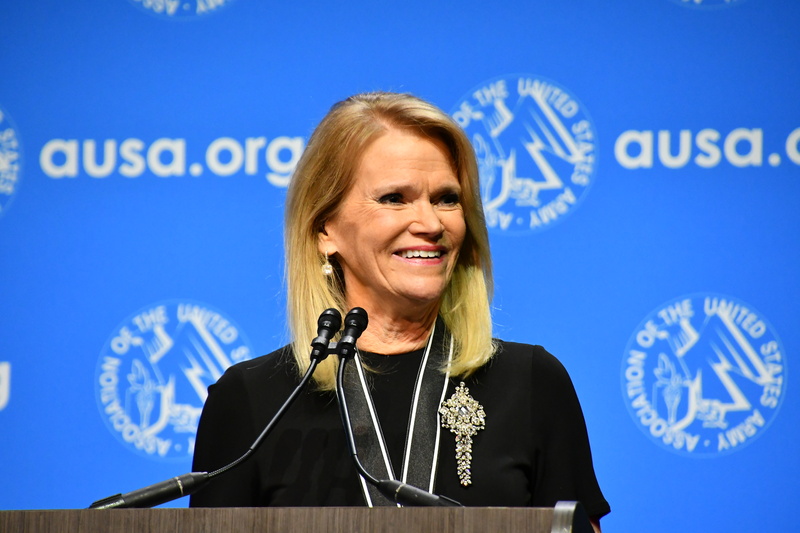 The 2018 Annual Meeting and Exposition of the Association of the U.S. Army, an event that drew more than 31,000 people, concluded Oct. 10 with the awarding of the association’s highest honor to ABC News global affairs correspondent Martha Raddatz for telling the American people about the strength, will and sacrifice of U.S. soldiers and their families. The largest annual display of land power in North America and a professional development forum drawing Army leaders and soldiers from around the world, Secretary of the Army Mark T. Esper declared AUSA 2018 to be “very successful” in a brief discussion with news reporters. Raddatz, who received the George Catlett Marshall Medal for sustained commitment to the men and women of the American armed forces, is the author of The Long Road Home: A Story of War and Family, which recounts a brutal 48-hour firefight in Sadr City, Iraq, in 2004, and its impact on soldiers and their families. The book was made into a National Geographic miniseries. Deputy Secretary of Defense Patrick M. Shanahan, a former defense and aerospace executive, mentioned during an Oct. 10 speech that AUSA events had been helpful to his own professional development. “I developed relationships early on that I draw upon today,” he said, thanking industry representatives for taking part in the meeting.